Do you know how leaders perceive you in the workplace — and beyond? Do you offer a unique brand proposition, or are you just another face in the crowd? Are you getting recognized, and is your career on a forward-moving trajectory? Have you earned the respect and reputation you need to get ahead? When someone truly shows up, you know it. Within seconds you’re impressed, intrigued, engaged and want to learn more – and maybe even do business with them in the future. In every setting and every environment, they’re great leaders, power players and innovative thinkers, and it always comes through and always makes the difference. It’s time for you to “show up.” ShowUp! is rooted in the notion that excelling in business is all about four Rs: Relevance, Respect, Reputation and Results! 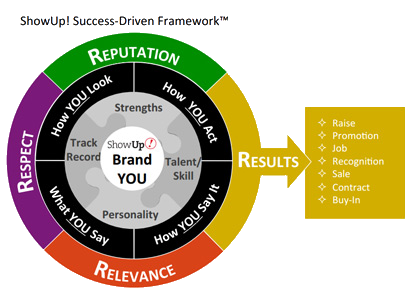 By projecting a strong personal brand and a powerful presence you’ll be perceived as relevant, garner the respect you need and shape the reputation you desire — and that’s when you’ll get noticed and realize RESULTS! Launched in 2013, ShowUp! (formerly Harris ImageWorks, LLC since 2007) is based in the Washington, D.C. area and has fast become a go-to for leaders, executives, entrepreneurs, politicians and organizations that are committed to SHOWING UP and achieving the successes they deserve.Our clients and partners come to us from coast to coast, representing virtually every segment and sector out there. We work with leaders at the top of their professions as well as those just starting out—and everyone in between. So what do these diverse clients and partners have in common? They’re all power players who want to reach even higher. They want to look the part, act the part and be the confident, charismatic professional who gets it done. They aren’t satisfied with the status quo. They elevate the playing field every time, and when they show up there’s no limit to how far they’ll go. Dress for Success Washington D.C.
"Once again, Ms. Harris has brought a true value to the members of the National Black MBA Association, Inc. DC Chapter." "Annette Harris is a dynamic presenter who delivers a message that can often be a difficult conversation to have." "Because of this powerful session, our fellows are one step closer to their next promotion." "...The information was extremely useful to the professional audience..."
"ShowUp! provided a true and relevant service...."
Our strategic partners are vetted and hand selected by Annette, the Founder & President of ShowUp! Each one brings value-add to the ShowUp! offering and is an expert in their field, ranging from personal care and grooming to professional skin care and cosmetic enhancements, hair and makeup, fitness trainers, weight loss services and more, plus a roster of photographers ready to snap that “after” shot for your social networks, CV, industry directories, websites and press communications. Based on the unique needs of our clients, ShowUp! taps into its proprietary database of strategic partners and experts to craft the optimal approach and assessments to ensure maximum value, impact and RESULTS.